In an interview with CBS News Wednesday, New York Democratic Rep. Anthony Weiner repeatedly refused to deny that his crotch is seen in a lewd photograph sent to a college student from his Twitter account. Weiner did say explicitly that he did not send the photo. "I did not, this was a prank, a hoax," he told CBS News' Congressional Correspondent Nancy Cordes. He said his "system was hacked into," noting that "we've retained a firm that is going to take a look at the Internet security that to make sure this does not happen again." Weiner said the firm would try to find out "exactly what happened." But Weiner would not say that he is not pictured in the photograph, prompting Cordes to say, "it sounds like it was a photo of you." Weiner responded, "well, we're going to try to find out exactly what happened." Later, Cordes said, "I think any normal person could say with certainty whether a picture was a photo of them or not, whether they had taken a photo of them or not." In response, Weiner referenced Jon Stewart's "Daily Show" segment Tuesday night in which Stewart suggested that the photo didn't look like Weiner for what Weiner called "embarrassing reasons." At another point, the congressman said, "the photograph does not look familiar to me." "But before I say anything I want to make sure that nothing was manipulated about it, that it wasn't taken - that something wasn't dropped into my account or taken out," he said. "This was a hoax," he continued. "It was committed on me, it was a prank, it was a relatively easy one to do, making fun of my name. My accounts were hacked in to. I think at some point we've got to start focusing on other issues." Weiner added that questions about the issue can get "more and more and more invasive and bizarre." Weiner did not directly respond to a question about whether he knows who is responsible for the incident. The photo in question was a close-up shot of a man's underwear, which was tweeted from Weiner's account Friday night. The picture, addressed to a Seattle college student's Twitter handle @GennetteC, was visible to all of the congressman's followers. Weiner's office over the weekend said the congressman's Twitter account was hacked, but on Tuesday, Weiner resisted answering questions about the incident. "Let's remember what happened here," Weiner told Cordes. "Someone posted something on my Twitter page that was apparently directed at someone who says they don't know me and I don't know her. She says she didn't get it. I didn't send it. So then it becomes how did someone get access to my account, how did someone get access to photographs, is the photograph - was it manipulated, was it dropped in, we don't know." "I'm trying to get to the bottom of it but I'm also trying to do something else - with all due respect," he added. "I'm trying to figure out the point at which it's reasonable and fair for me to say - this is ridiculous already." "This is a silly conversation to be having over and over and over again about something that really doesn't amount to very much," he continued. Weiner did interviews with a number of media outlets Wednesday to deal with the issue. 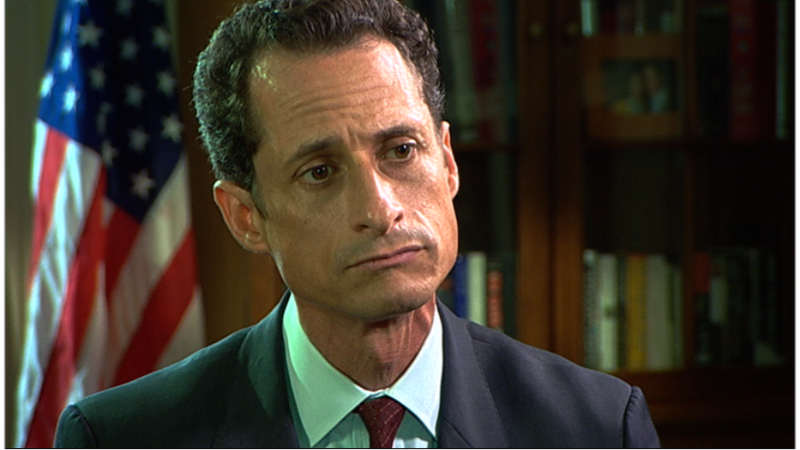 In an interview with NBC, Weiner said, "I can't say with certitude" that the picture is not of him. Weiner has not asked the FBI or Capitol Police to investigate the matter, and he said he is "not treating it as a federal case." Cordes asked why he is not seeking an investigation to clear his name. Weiner responded that "one of the reasons I asked a law firm and Internet security operation to come in is to give us advice on that." "It's causing mischief but that doesn't necessarily mean that I ask the taxpayers of the United States of America to undergo a big investigation on who posted a silly picture on my Twitter page," he said. Asked if he had had private, email or Twitter conversations with the college student to whom the picture was sent, he said, "I don't know this woman, this woman doesn't know me." He said he hasn't spoken to her since the incident occurred, adding, "I'm a victim, but she certainly is." In response to a question about how his wife, Huma Abedin, is dealing with the situation, Weiner called her a "very strong woman." "But, you know, when you have people who are standing outside our house, when you have her sister being harassed by reporters because I happen to follow her, and she happens to be a very lovely woman, something has gone terribly wrong," he added. "And so I think I have a right to a certain level of privacy and a certainly level to say, 'okay enough,' and hopefully by having a long conversation with the folks at CBS we'll get to that place."